One of the most important challenges, however, is not purely technical. It is the process of building the trust needed for the user to happily give up control of the vehicle. In fact, research by J. D. Power has identified that more than two thirds of consumers in both the US and Germany would either ‘definitely not’ or ‘probably not’ trust an automated vehicle. This is a very significant barrier to adoption that the industry must address in advance and will lead to an extraordinary focus and value being placed on the Human Machine Interface (HMI). The good news is that the transition to fully autonomous vehicles (AVs) will not be overnight and users will have a chance to get used to a phased increase in automation. Indeed, J. D. Power has also reported very positive acceptance of ADAS (Advanced Driver Assistance Systems) features by consumers. However, even a phased increase in automation will drive big changes in the HMI. We are, for example, already seeing a rapid increase in the use of touch screens and the size of those touchscreens in the vehicle. The rate of HMI innovation is also being accelerated by new market entrants and the convergence of the consumer electronics and automotive industries. What can we predict about where this fast rate of HMI innovation will eventually lead? Well, up to now, vehicle HMIs have been extremely focused on the driver with almost no control available to the passengers. But in the world of fully autonomous vehicles, is there even “a driver” and “a passenger”? In fact, it is very likely that the advent of increasing autonomy will democratise the control of the vehicle and this will have the effect of “spreading out” the HMI to make it accessible to multiple occupants. Not only will there be a spreading out in physical space over the interior surfaces of the car, there will also be a spreading out in functionality as people work or entertain themselves in new ways during their journeys. This spread out HMI will consist of increasingly intelligent, “smart surfaces” for which touch screens that conform to the curved and shaped surfaces of the interior will be a vital component. The HMI enabled by these surface integrated displays will present interaction opportunities to users independently of where they are sitting and make the interactions easy and self-explanatory (no more fiddly switches with obscure symbols!). The screen area can be ‘hidden until lit’ at times and can be used to create a welcoming and reassuring ambience at other times. There is also an opportunity to provide customisable and downloadable elements of HMI and ambience to configure and personalise shared mobility vehicles, so user feels like they are using their own vehicle. 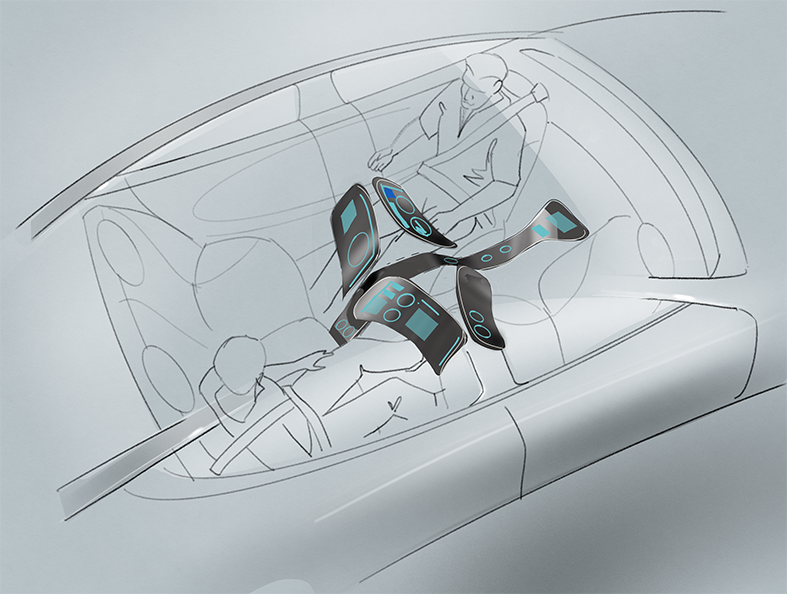 The adoption of conformed and shaped displays integrated into the interior surfaces of the car will have an interesting side effect on the vehicle design process because now displays will be “styled” and they will be integrated into a holistic interior design concept in a way that was not possible with traditional flat and rectangular displays. This will bring the OEM’s design teams, the OEMs display sourcing function, the Tier 1 and the display manufacturer into a much closer and more collaborative relationship than typically exists today. Of course, an excellent question is how will the increased screen area be paid for? Here, another important factor in the transition to full autonomy becomes significant which is that the tactile experience of driving will no longer be relevant. This will support the shift of dollars that are spent today “under the bonnet” to implement enhanced user experience features in the HMI. Another positive factor is the opportunity, given the increased screen area in the car, to generate revenue from advertising and content-driven subscription services. That having been said, it will still be important to identify the most cost-effective way to implement this new generation of HMI. With plastic organic LCD (OLCD), FlexEnable is developing the most robust and lowest cost conformable display technology for this application. We are doing this by adapting mature and scaled TFT LCD processes based on glass and converting them to plastic using an industrially proven approach. This enables a revolutionary expansion of the design rules for automotive displays whilst only requiring an incremental change to the automotive supply chain. If you are looking for a conformed or shaped display solution for consumer, industrial or automotive applications, get in touch with us at info@flexenable.com.